Listen, once I heard that you could make DIY croissant doughnuts (I'm not mentioning them by name, but we all know what I'm talking about here), I simply had to try it at home. And I am beyond delighted to report that it is easy, and the results are so highly delicious that you just might gain a hundred pounds before Christmas if you make them as frequently as you'll want to after giving it a try. The only tough part is monitoring the temperature of the oil for frying. I am lucky because in a stroke of fate, a company that makes something called Chef Alarm had contacted me just a week before I decided to get frying at home and asked if I wanted to try out their product. 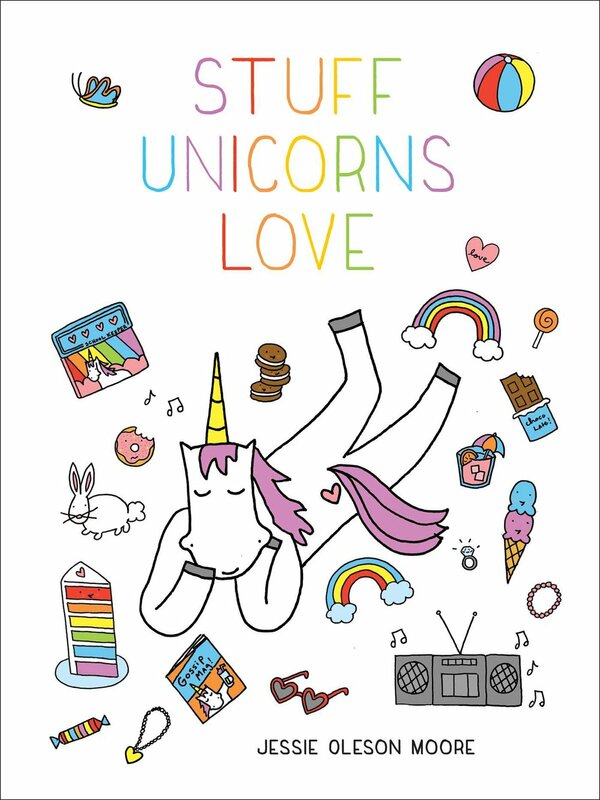 Um, yes. So while they sent me the device for free, they didn't pay me to say good stuff about it. But happily, I liked it. 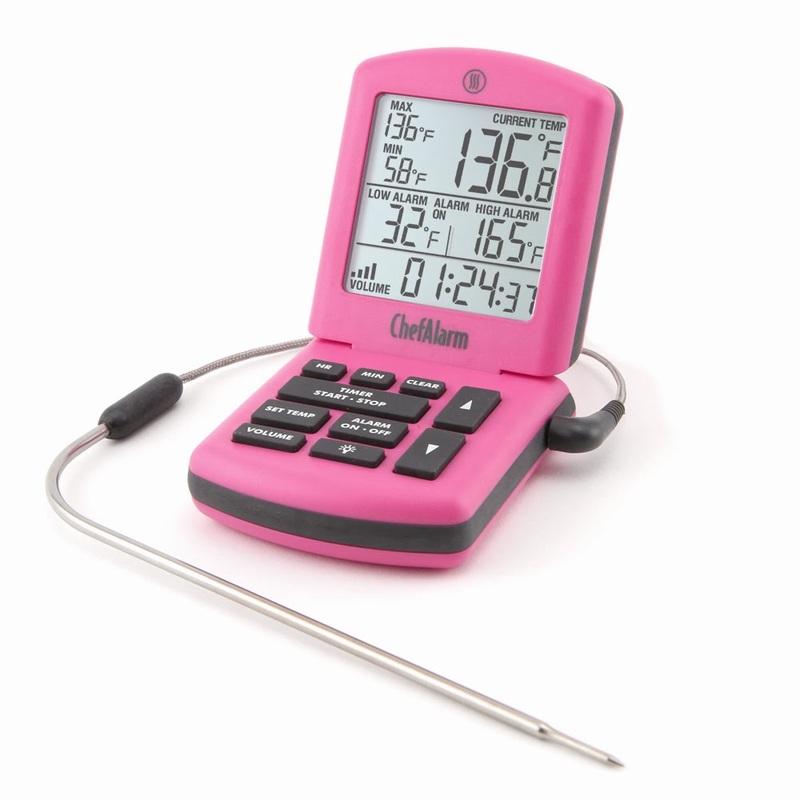 This helpful gadget includes timers, a temperature probe, and temperature monitoring so it will notify you if things are going outside of the comfort zone. But the absolute best part is that it comes in pink. YES! I think it's a nifty tool and would probs make a good present for the baker in your life this holiday season. The reason why you have to monitor the temperature for frying? A few reasons, but from my point of view, a huge reason is that you can't tell how hot the oil is at any given time. It looks the same whether it's 280 or 390 degrees. 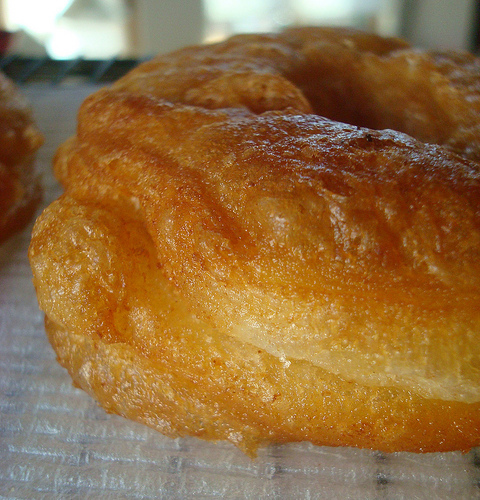 If it's too hot, your doughnuts can fry too fast on the outside and be doughy on the inside. 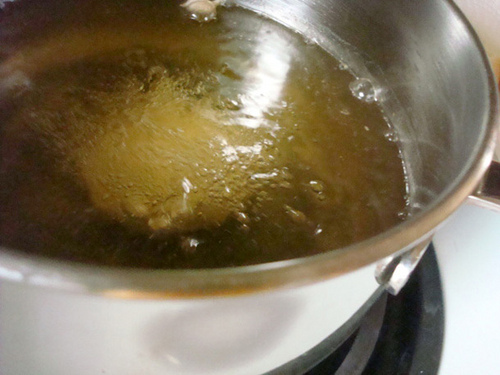 If the oil is too cool, it will take too long to fry them and they'll be leaden. Nobody wants either! But anyways, I know you're frying--er, dying--to read more about the doughnuts, so let's get down to business. 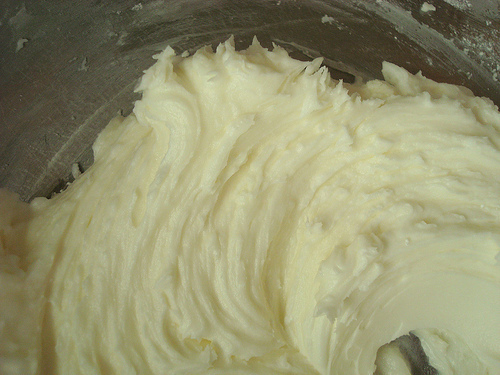 about a cup and a half of buttercream, pudding, ice cream, custard, or whatever filling you want. Step 1: The first thing you do is open up the can of crescent rolls. Enjoy that "pop" as they release themselves in their carbohydratey glory into the world. Step 2: Now, roll them into one big rectangle. 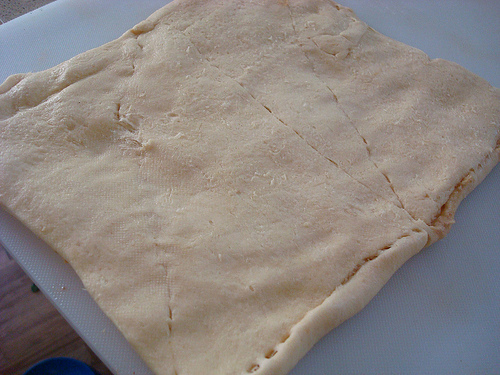 Then, fold it on top of itself so you have a big square. Press gently to remove the "seams". The better you work the seams, the prettier your doughnuts will look later. 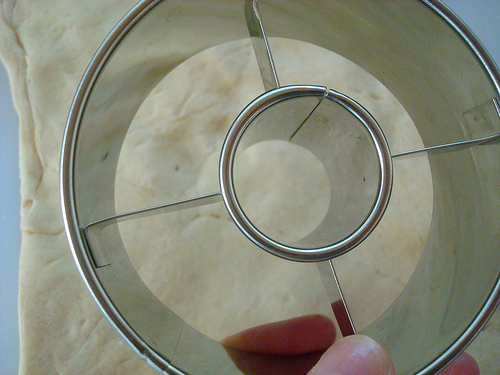 Step 3: Now, grab a doughnut cutter (just go buy one if you don't have them - they're like $2!). Cut out as many doughnut shapes as you can. 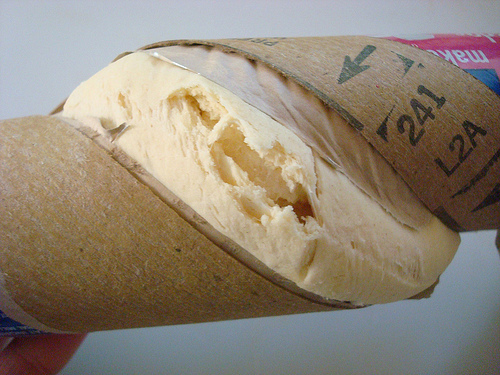 Re-roll the scraps and cut more, but be aware that the re-rolled ones, to be frank, will be the ugly ones. Step 4: Fill a frying pan with some vegetable oil. You want at least a few inches of oil in the pan. Heat it until it reaches about 350 degrees. You will want a thermometer of some sort for this, trust me. 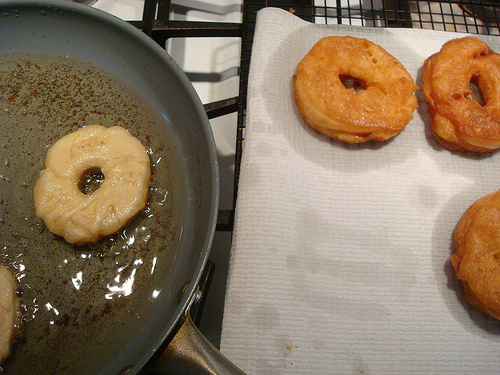 Step 5: Place the doughnut cutouts a few at a time into the hot oil. Fry on each side until golden and puffy. It won't take long. Remove gently, using a slotted spoon, and transfer to paper towels to blot excess oil. Step 6: Cut the doughnuts in half like you would a bagel, and fill with buttercream, pudding, custard, or whatever your heart desires. Glaze if you wanna, or just stuff your face immediately. Do you enjoy frying at home?